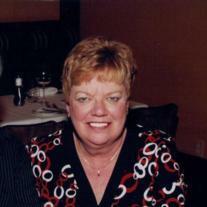 Gayle Sigurbjorg Hayes, age 64 of Delaware, passed away Saturday, April 28, 2012. Gayle was born February 1, 1948 in Reykjaviki, Iceland, daughter of Ingvi Gretar and the late Betty Gretar. Also preceded in death by her brother, Eric J. Gretar. At a young age, Gayle and her family settled in Berea, Ohio. It was there where she grew up and spent her childhood years. Gayle graduated from The Ohio State University and held various administrative positions before retiring from HSBC after 38 years of service. Gayle was a refined and elegant woman. She was organized, gracious, and had the ability to make people feel very special. Gayle was the type of person that if she was going to do anything, she always had to make sure it was done well. She was proud of her Icelandic heritage and also enjoyed traveling. She will be greatly missed by her loving husband, James Eric Hayes; father, Ingvi Gretar; and many other extended family members and dear friends. James would like to extend an invitation to family members, friends and colleagues to please join him from 4-7 P.M. Thursday, May 10, 2012 at SCHOEDINGER WORTHINGTON CHAPEL, 6699 N. High St., for a time of remembrance and celebration of Gayle’s life. There will be great stories, food, and “spirits” and enough love and laughter to fill a room. In lieu of flowers, memorial contributions may be made to the Capital Area Humane Society, 3015 Scioto Darby Executive Court, Hilliard, Ohio 43026. To share memories or condolences, please visit www.schoedinger.com. If you have any information, memories, or thoughts to share, please post a response.